Have you ever stood next to someone and gave them a quick glance and at that very moment passed judgement on them? Guilty! All of us have. We seem to be hard wired to do so. Unless your heart comes clean, and you train yourself not to do so it continues. You never know what your fellow man is or has gone through. Walking a mile in their shoes would definitely change one's mind. 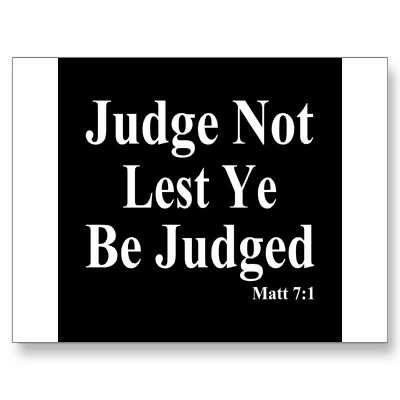 When we look at the days of Jesus and watch the manner in which he treated people, you never see or hear judgement except towards the hypocrites and really he called them out on their harsh judgement of others. In order to enter the kingdom of God we must change our ways. Do not give what is holy to the dogs; nor cast your pearls before swine, lest they trample them under their feet, and turn and tear you in pieces.Judge not, that you be not judged. 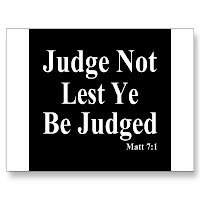 For with what judgment you judge, you will be judged; and with the measure you use, it will be measured back to you. And why do you look at the speck in your brother’s eye, but do not consider the plank in your own eye? Or how can you say to your brother, ‘Let me remove the speck from your eye’; and look, a plank is in your own eye? Hypocrite! First remove the plank from your own eye, and then you will see clearly to remove the speck from your brother’s eye. Ask, and it will be given to you; seek, and you will find; knock, and it will be opened to you. For everyone who asks receives, and he who seeks finds, and to him who knocks it will be opened. Or what man is there among you who, if his son asks for bread, will give him a stone? Or if he asks for a fish, will he give him a serpent? If you then, being evil, know how to give good gifts to your children, how much more will your Father who is in heaven give good things to those who ask him?